Far over 2000 people - young, old, families, intellectuals, activists - from all walks of life once again gathered with their handmade placards and Palestinian flags in the centre of Ramallah this Saturday afternoon. The beatings, arrests, tear gas and other police brutality meted out last week against a similar protest had predictably only grown the anger and the determination of the people to ensure the PA would begin enacting policies that defend the rights of the people and support Palestinians in struggle, starting from an immediate end of the blockade of salaries to Gaza and payments for electricity for Gaza. Over the last week instead, the PA has clearly received and understood at least one message: You do not repress your own people. This time, PA forces even handed out water to the protestors. “Used to 70 years of Israeli apartheid, clearly PA police repression won’t stop people’s protests. It is good to see the PA has realised that it cannot fight its own people in the streets. Now it is time to understand that it cannot oppress them by withholding essential funds because of narrow political interests - whether in Gaza or anywhere else! 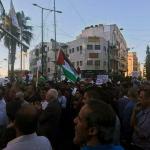 This protest was already preceded by a protest in Bethlehem the day before, Friday June 22. Another protest in Ramallah is already planned for June 29 - until the demands of the people are met.